Serenading the festival of colours! There is a child in us, who wants to break the rules, give his/her indulgent sweet tooth a free run, get drenched and dirty, and this day allowed us to dedicate ourselves to the wayward, the spontaneous and the nomad in us. Holi then stood for that unfettered spirit of celebration of life itself. 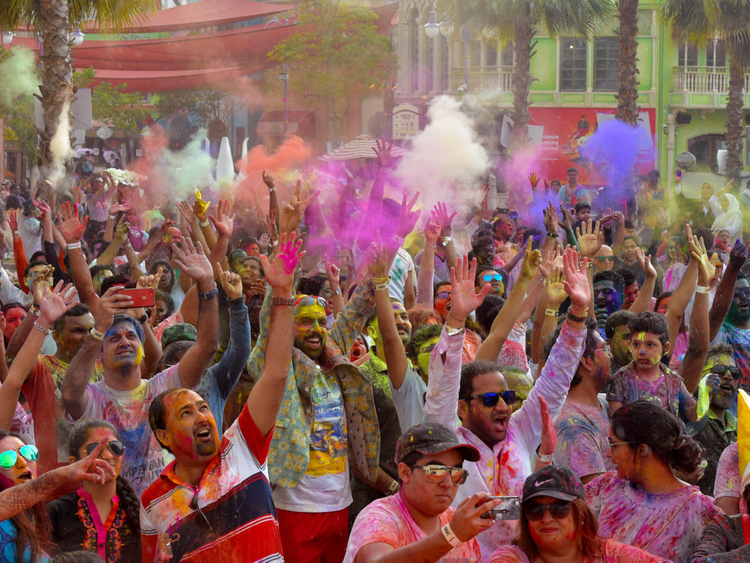 From collecting wood for the bonfire to the preparation of sweets and vegetable colours, like other Indian festivals, Holi came with an elaborate preamble, and the festival mode kicked in weeks in advance. The celebrations were inexpensive; the entire family pitched in with the preparations and happiness came without a price tag. One could smell the festive aroma a week in advance. Mother would set aside a glass of milk every day and every third day, cook it until it condensed to a thick consistency, collecting a mound of mawa (home-made condensed milk) in a week to make sweet milk and pistachio dumplings. The house was fragrant with the aroma of roasted chickpea flour for laddoos and savouries. We kids would help in making vegetable colours. Flowers of tesu and marigolds were dried and powdered. Turmeric and indigo and orange peel powder were mixed into rice or corn starch paste. The paste was dried in the sun, and it would crumble into the most vibrant hues of red, yellow, blue and orange, waiting to be used in our arsenal of Holi squirters. On Rangapanchami or the second day of Holi, everyone from toddlers to grandparents participates spiritedly in the colour fest. Wearing spotless white clothes, we would go door to door, singing folk songs, smearing colour on faces of friends and strangers, making pit stops at every neighbours’ home to sample the delicious sweets and savouries and quenching our thirst with a special almond and condiment thandai. By late afternoon the procession usually ended in a park where people broke into spontaneous songs and dances. The combination of the colours, food, beverages and dance lulled us into a sort of a trance. We would stagger home happy and tired, looking forward to washing away the colours from our bodies. Mother would always keep a cool paste of chickpea flour, yoghurt and turmeric to remove the excess colours. The bath after Holi was a ritual that made us feel as though we had participated in a thorough spring cleaning of the mind, body and soul. So much laughter, so much music and camaraderie made us fall into a deep slumber after the bath. The most memorable part was the early evening dinner. Family members attired in cool whites to offset the colour medley of the day, glowing with green, blue and red hues that showed off the vestiges of their indulgence, would regroup. The evening gathering was always a muted meeting of a bunch of cathartic individuals feeling like they had poured out all the darkness and the hostility of the year, and were clean inside out. The meal always had a special jackfruit curry and rice which to this day I always associate with Holi. The most popular Holi refrain to this day is Bura na maano Holi hai (Do not mind my manners because it’s Holi). Although it gave people the licence to be unruly, an unwritten code of civility and decency was always observed and the festival usually saw sworn enemies bury the hatchet and come together in a colour-propelled frenzy of friendship. These days, with hyped rain dances and branded celebrations, I prefer to remain indoors looking to savour that pure, spontaneous streak of festivity that I always associated with Holi.